Codex is a new game from David Sirlin that is currently in Kickstarter. I played an early print and play version at Worlds and had a blast with it, and decided to back the Kickstarter. What do you guys think? Anyone else here backing or tried out the early versions? I am thinking about making my own print and play set to play asap. Sirlin has been posting a series of articles going into some details on each of the various specs. I’m interested, but the idea of exclusive “deluxe edition” map cards feels odd to me for a dude who’s so focused on competitive play. I’m on the fence. I think it looks cool, but a $200 buy-in (because I’m obviously going to want to go all or nothing) for something that I have no earthly idea if I’ll actually get to play anywhere other than my kitchen table is making me extremely leery. I think those are for more casual play and the competitive mode is map free. Yeah, I kindof assume the same - just feels odd… since he’s ranted so much about equal access to everything for all players. Nothing that says you can’t just write the rule down and follow it. It and TMNT are on my KS watch list right now… The deluxe didn’t seem like a great deal at the start, but now that it has all that stuff in it… I might add it to my collection of games I don’t play because I own netrunner? 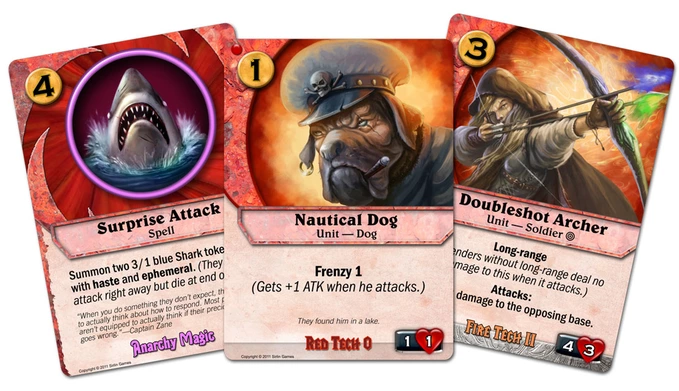 Netrunner does need some shark cards. That’s my chief takeaway here. I’ll wait for what people think a month or so out of getting it personally. I’m a huge fan of Sirlin’s work, especially Yomi (SO MANY HOURS). That said there’s something about this that seems off to me. It would be a real challenge to get enough of a scene going with a game that’ll be in such limited supply based on the availability of Sirlin’s other games, and if it doesn’t take off the distribution won’t improve. Also I’m not really down with dropping $200 on something that’s unproven. Needs a bit of time I think. If anything, you know it will be balanced. Sirlin is very diligent in playtesting for balance from what I’ve seen. Can you help me to understand where is the difference from the other “atk/def” game ? The biggest difference is that you build your deck as you play based off of the codex of 3 heroes that you brought. So it is somewhere in between a deckbuilder like Dominion and a traditional card game like Netrunner. The core premise is that you can adapt your deck during the course of the game to what you see the opponent teching. Another big new mechanic is the patrol zone, which adds a lot of depth to the traditional attacking / blocking model. There are a bunch of other things that make this game pretty unique, but that is a good start. I am predisposed to liking this game. As someone who likes the art of design, think I will enjoy titular codex on the fly deck building because I like having to evaluate cards. Because I like deck builders and I really like drafting magic, probably more than playing out the draft (because it can feel like a 3 hour long scoring phase). So I’m really excited by the Codex aspect of Codex. I’m only apprehensive about the turn by turn play. Seem pretty similar to magic combat but there is the patrol zone, building, and heroes. I worried that it might not be easy to explain holistically. Especially for people who don’t already have an understanding of magic. I’m worried my teaching will become, OK here is how magic would work if we were playing magic, got it? good, because here is 4 more rules. This was my experience with teaching Puzzle Strike, a game I like a lot, but it can be an uphill climb to teach all moving parts. Now I could be wrong, I haven’t played it yet. All I have seen is the majority of the kickstarter videos. Worse case scenario for me is I wait for a digital version and just play it online as I have with Puzzle Strike, so I don’t have have to bother with teaching it. Looks really cool, and I want it! I can’t back the kickstarter. Shipping to Norway for a core set is more than the cost of the box ($59 vs $45), and I’ll get VAT and a customs fee on top of that. No dice. It didn’t really click for me until the “tech” phase, which suddenly makes the game sound fantastic. Until then, it looks a bit like a more boring magic (because of no instants) / The Blizzard Game That Shall Not Be Named. Has anyone played Mage Wars? That one has the whole Codex thing too, right? Has anyone played Mage Wars? That one has the whole Codex thing too, right? Yeah. I really don’t like it. It very much feels like someone started from Magic (keywords everywhere, which overlap heavily with M:TG), had an idea of how to fix mana screw/draw luck in general, then added variance back in with dice rolls everywhere. And also decided that 90+ minute games were more fun. The recent Academy set should fix the playtime issue, but doesn’t address the fact that it’s just not a very interesting game. I like Mage Wars fine, but it’s one of the least played games in my collection because it requires so much setup/keyword learning. That said I’ve enjoyed the ridiculousness of the whole thing once it gets rolling. I haven’t played Academy but I feel like stripping it down defeats the point. Codex having deckbuilding mechanics in-game could slow it down even more than Mage Wars at points, which is a scary proposition. It seems simple enough, and it’s enough like magic that it’ll attract that crowd that wants something different, but not overly so. Like hearthstone. Whatever, I’d like to play it, but i don’t think I’d ever buy it unless i was over encumbered with disposable income. A proper digital version of Codex would be ideal for me to make it easier to find opponents of a similar skill level, but there’s no timeline announced for that. In the meantime I can recommend the game if you have a buddy in meatspace who will play it with you regularly, otherwise you’re probably best to wait. I heard that Tabletop Simulator has Codex on it now - haven’t tried it on there but if you have that program anyway then you can try before you buy that way. I have played Mage Wars. The tech mechanic is kind of similar aesthetically, but in Mage Wars your binder is just a large hand, whereas in Codex the binder would contain the cards that can potentially go into your deck. I loooooooove Puzzle Strike, but I’m on the fence about this one. One of the great things about Puzzle Strike is how deep and balanced it is for how fast it is to play and how easy it is to get started. Puzzle Strike fighters come with 3 unique chips and that’s it, so you don’t have to worry too much about which one you pick at first. In Codex, you choose 3 heroes and it seems like each one comes with a lot more stuff, which sounds like a recipe for decision paralysis until you’re a pretty advanced player.